Rural areas in Japan are suffering from a variety of setbacks—massive depopulation, severe aging, and economic stagnation to name a few. Small-scale family farmers unable to compete on an increasingly globalized stage are being weeded out, abandoning their farmland, and agricultural communities run the risk of disappearing altogether. Adding to the pain is the threat of environmental pollution and climate change. Faced with these problems, many rural municipalities have initiated rural development projects aimed at revitalizing farming livelihoods, local culture, and environmental sustainability. Rural development projects in Japan come in various shapes and sizes—Higashiomi City, Shiga Prefecture, decided in the late seventies and early eighties that it would focus on revitalizing its farming communities through an intensive system of recycling. After nearby Lake Biwa, Japan’s largest lake, experienced a series of “red tide” events linked to water pollution from household detergents and agricultural fertilizers in 1977, locals established a number of campaigns aimed at cleaning up chemical waste from homes through recycling programs. One such effort looked at converting used cooking oil into eco-friendly soap. When the recycling of used cooking oil into soap began to reach its economic limits, alternative uses for the oil were researched– the most promising alternative involved the idea of refining and recycling the oil into fuel. In 1996, Higashiomi City’s Aito municipality (pop. 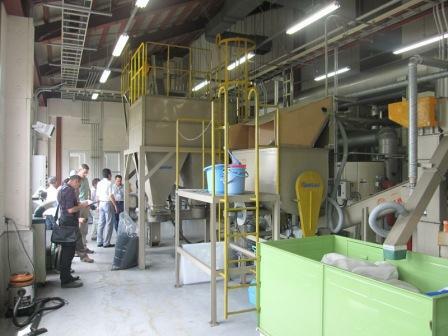 5,700) opened a test plant to convert household cooking oil into BDF (Bio Diesel Fuel). Each of the 1,400 households received a five-liter drum in which to collect their used oil and mass collections took place twice a month. The BDF produced from the plant was used in city vehicles and local buses. With the successful implementation of the BDF from cooking oil project, Higashiomi City was ready to take the concept a step further. In 1998, the “Aito Nanohana (Rapeseed) Eco Project” was announced with the idea of growing rapeseed on abandoned farmland to convert into BDF and cooking oil. Japan once cultivated enough rapeseed for cooking oil to be completely self-sufficient and yellow rapeseed blossoms blanketed the land in the summer—this changed after WWII when cheap, imported cooking oil was made available and Japan currently sits at about 4% self-sufficiency for vegetable oil. Yellow swathes of rapeseed were planted on 12 ha of abandoned farmland scattered through out the Aito area and soon visitors began flocking to Higashiomi City to walk and photograph the fields. Eventually, yellow rapeseed blossoms became the city’s official symbol and other rural Japanese cities and villages started to implement their own “Nanohana” projects. There are currently over eighty projects of this type in Japan. The BDF operation in Aito produces 10,000 liters of BDF annually, cooking oil that is used in every local public school lunch kitchen and sold in the marketplace, and has increased tourism-based sales in the area by nearly 40% every time the rapeseed is in bloom. When the rapeseed is crushed to make oil (rapeseed is composed of 30% oil and 70% meal by weight), the oil meal is composted and returned to the fields, closing the waste loop. But the story of recycling in Higashiomi doesn’t stop there—looking to further increase the use of waste biomass in the community, rice husks were targeted as a feedstock for soil amending charcoal. Rice husk charcoal has a long history of use in Japanese agriculture and farmers traditionally produced rice husk charcoal to amend their rice paddies and dry fields. But many farmers gave up producing rice husk charcoal after chemical fertilizers were popularized in the 1960s. In 2005, Higashiomi City officials opened a new Eco-Plaza in the Aito area called the “Nanohana-kan” designed to house the BDF operation, a new automated rice husk carbonizer, and municipal waste recycling center. Each year since then, about 250 tons of rice husks collected locally from 600 ha of rice paddies are carbonized to produce 57 tons of rice husk charcoal. 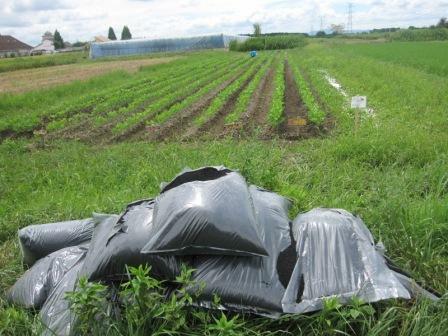 A 100-liter bag of rice husk charcoal, named “Bio-tan” (or “biochar”), sells for 700 yen (about $7.00-$8.00 USD) and is purchased mainly by farmers, gardeners, and golf course managers. Local farmers say Bio-tan improves clay-rich soils’ structure, making it better aerated, and also contributes to better tasting, greater yielding root crops like potatoes, carrots, and radishes. 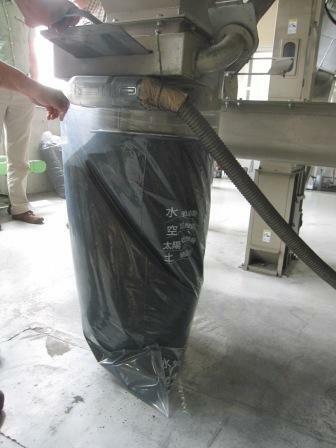 The rice husk carbonizer in operation in Higashiomi was designed and produced by KANSAI Corporation, a company with over 69 years experience with rice husk technology. KANSAI developed the world’s first automated rice husk carbonizer in 1967. Currently, 80 large-scale and over 300 small-scale KANSAI carbonizers are operating throughout Japan. 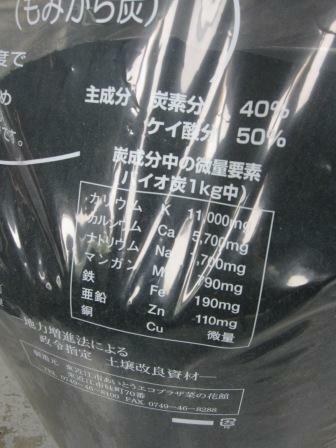 Three percent of all the rice husks produced in Japan by weight are processed in KANSAI carbonizers. Their main customers are agricultural cooperatives and local and prefectural governments. The carbonizer at the Nanohana-kan in Aito has been running eight hours a day for five years without interruption. BDF is used in the starting of the carbonizer. The heat produced is utilized to dry crushed rapeseed meal and in warming nearby seedling greenhouses. Higashiomi City hopes that it can serve as a model for other regions in Japan in order for the concept of a “recycling society” to become a reality. Furthermore, the idea of linking up biochar production with other existing eco-friendly, waste-recycling movements at the local and regional level is something those of us involved in biochar can learn from. Steven McGreevy is at Kyoto University Graduate School of Agriculture, Kyoto Japan. For more information, please contact: srmcgreevy@gmail.com. Bio-tan label with amounts of K, Ca, Na, etc.